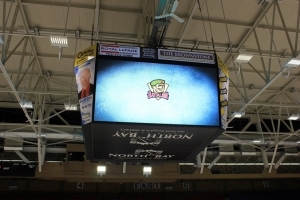 A community ice rink and ice hockey facility required a display for a screen and scoreboard, to be suspended from a supporting roof structure. This required a safe lifting system including load cells for correct weight distribution and balance. Suspension was by means of rated lifting points in each corner of the aluminum screen structure. Lifting power was provided by four independent 2 ton electric chain hoists which can be energised individually or as a group by means of a single “GO” button control. Final suspension was to be provided by adjustable static rigging hardware pre-installed in the roof beams. Should one hoist not support its equal part of the load, that corner would drop and the structure would tilt on just two opposite suspension points, grossly overloading those two points. Catastrophic failure would follow. An aluminium structure supporting four LED screen displays was to be permanently suspended over the ice rink from the roof superstructure. The structure was lifted on four chain hoists. To ensure each hoist was supporting the required share of the load, BroadWeigh load cell shackles were placed between the four lifting hoists and the aluminium structure’s lifting points. The load data from each cell was displayed on a computer screen. Each hoist was energised individually until all four hoists were supporting correct portion of the weight as displayed on the computer. Once the load was suitably balanced, all four hoists were energised lifting the structure and screens to the correct trim height. Once at trim the structure was connected to the permanent rigging hardware with a second set of BroadWeigh load cells. The load was then lowered onto the permanent suspension points with adjustments having been made to ensure the load was suitably balanced on all four points. The load cells were removed from the permanent suspension hardware once the correct length for each suspension leg was set. Once the four LED screen displays were set onto the permanent hardware the chain hoists were removed along with their load cells. This procedure and load monitoring equipment provides a safer lifting operation for sports arena display systems, score boards and other suspended equipment. In addition this solution can be utilised for various other lifting operations involving the balancing of multiple hoists or winches which is especially useful in load monitoring for sports arenas.